Israel Hands holds a unique position in all of the lore of pirates. He is, at the same time, a character out of Robert Lewis Stevenson’s Treasure Island, and a real-life pirate of some fame. First the historic man. Like most pirates, the real Israel Hands first comes to our attention as a grown man, his origin completely unknown. 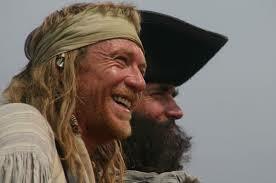 It seems that he was Blackbeard’s second-in-command. 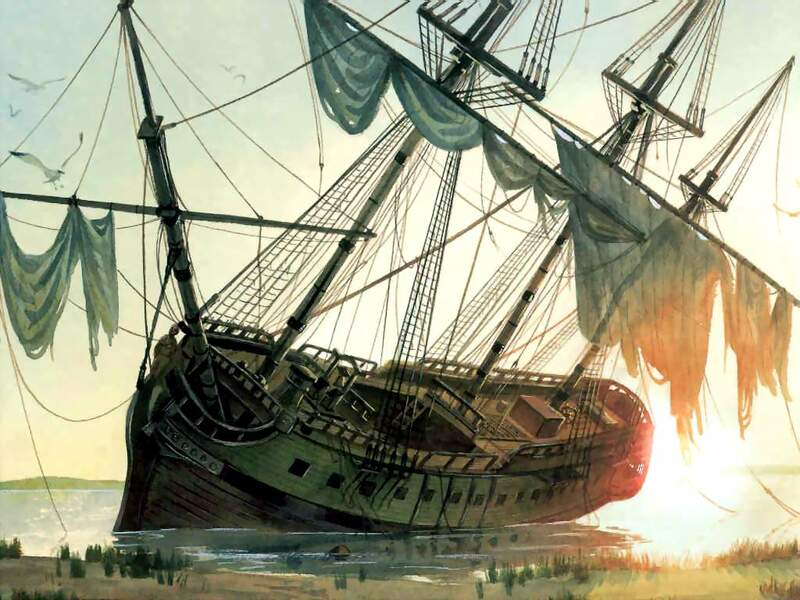 On April 4th or 5th, 1718, Blackbeard, sailing the Queen Anne’s Revenge, had been harassing shipping coming to and from the port of Vera Cruz, Mexico. While doing this, he captured a logwood cutting ship named the Adventure and captained by David Herriot. 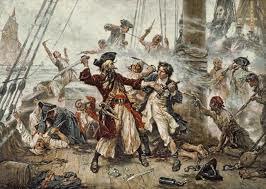 Blackbeard forced Herriot to join his crew, and gave the ship to Hands, who became her captain. Hands continued in the ship as companion to the Queen Anne’s Revenge, until June of that year, when Blackbeard (some say intentionally) ran the ship aground on a sandbar near Beauford Inlet NC. Hands attempted to use the Adventure to help kedge the Queen Anne’s Revenge off the bar, but the much larger ship was too badly stuck. So Blackbeard and Hands loaded the Adventure will all of the treasure and half the crew of the QAR and set sail for the Ocracoke Island, off the shore of North Carolina. It was here that Blackbeard spent time “going straight.” He made contact with Governor Eden, spent treasure buying a house in the town of Bath, received a pardon for his piracies, a according to some sources. Married a local girl. But Blackbeard also kept up his old ways. Hands and the remaining pirates formed a camp on Ocracoke, where they could watch the local shipping lanes, and occasionally sailed out for quick raids, mostly on shipping from Virginia. 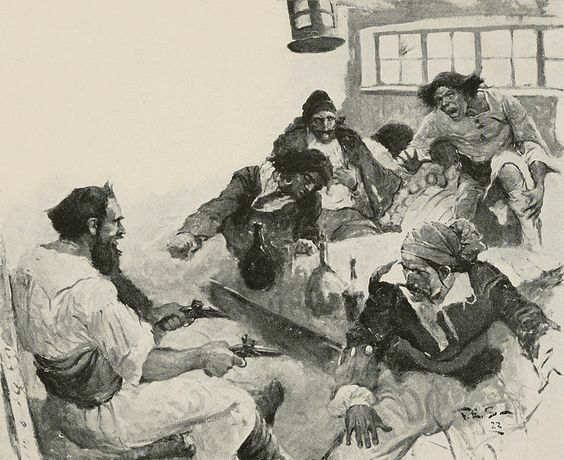 In between these pirating adventures, Blackbeard threw epic parties on the island, along with visiting pirates such as Charles Vane and Jack Rackham. And after that? We don’t really know. Captain Charles Johnson writes that Hands died in poverty, but Johnson was writing to please a publisher, and the authorities wanted MORAL tales about pirates, and that meant an unhappy death for those who did not reform. Hands’ actual ending remains a mystery. But his name lived on, and what a grand one it was! “Israel Hands,” possibly Dutch, maybe even one of the renegade Jews who had fled Spain for Holland inches ahead of the Spanish Inquisition. It’s a great name for a pirate, and that’s for sure. 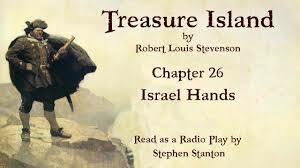 So Robert Lewis Stevenson, author of Treasure Island, conjured up a sailor named Israel Hands, fond of spitting, and coxswain of the ship Hispaniola. This Hands is second in command to Long John Silver, in much the same way the historic Hands was to Blackbeard. This Israel is also noted as having been Flint’s gunner, and then men set great store by his talents. 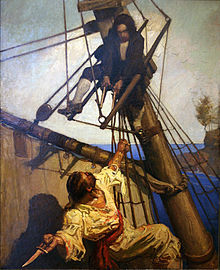 Hands and a pirate named O’Brian are the only two aboard the Hispaniola when Jim Hawkins swims out to cut the ship’s anchor cable. Hands and O’Brian are deep in their cups, fighting about something that is never explains. Jim does not see the murder done, but Hands kills O’Brian, though he is injured himself. Jim comes across Israel Hands, who asks for brandy, and announces that he has no regret that he has “settled (O’Brian’s) hash.” Jim tries to enlist Hand’s aid in getting the ship steered around the island and run aground on a sandy shore. But Hands turns traitor, takes up a knife and tries to kill Jim. In one of the most famous scenes from the book, Jim climbs the rigging and takes refuge in the crow’s nest. The pirate approaches. 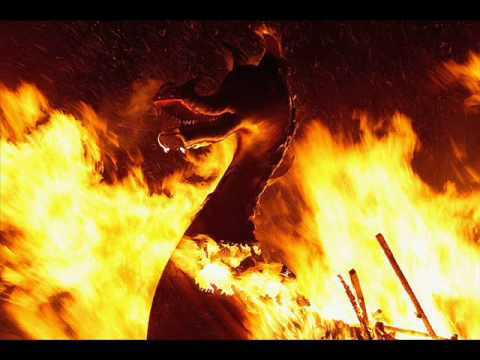 “He (Hands) began to see the dice going against him, and after an obvious hesitation, he also hauled himself heavily into the shrouds, and with the dirk in his teeth, began slowly and painfully to mount. It cost him no end of time and groans to haul his wounded leg behind him, and I had quietly finished my arrangements before he was much more than a third of the way up. Then, with a pistol in either hand, I addressed him. "One more step, Mr. Hands," said I, "and I'll blow your brains out! Dead men don't bite, you know," I added with a chuckle. Dead men don’t bite, but some of them do live on. Israel Hands, real pirate and fictional. I wonder what he’s think of his fictional legacy? Kolkata escorts live in a comparative city and was encountering an exceptional time of life.